The House of Chanel: Timeless Fashion. Everlasting Style. Gabrielle “Coco” Chanel ran Chanel from 1909 – 1971, She founded her couture house, revolutionized fashion with her back-to-basics approach. Chanel’s vision for her designs of elegance, class and originality in woman’s wear was born during a time when a woman’s clothes were more about opulence. At the time she began designing women were in need of more practical clothing as many were doing factory work as it was during WWI and the work conditions demanded a more warm wardrobe. 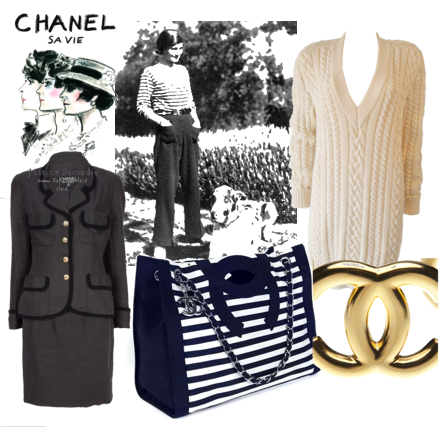 Coco was inspired by men’s clothing and designed flannel blazers, straight linen skirts, sailor tops, long jersey sweaters, shirt jackets; all items not only still worn and considered fashionable today in the Chanel line, but all are available items in lines of other designers around the world. Chanel still reins as a fashion leader.